With the new version coming out in about a week, I was curious to see if anyone else was planning to pick up a copy. If so, what modes are you planning to play? Which platform? Playing on Xbox One. I primarily play MyGM and MyCareer. Rudy Gay has been very good for the last three years. I hope that continues. I read somewhere that Cousins' rating is 85 in the game, is that true? I think it's a bit low considering Anthony Davis is at 91 or so. I don't think AD is 6 rating points better than Cuz. If anything, Cuz is a more skilled player than him. Yea, I hear you. Cuz is always underrated because of his reputation. He always has to work harder to get respect. Some of that is his own doing, but we are talking about a player rating based on skills here. If AD is 91, Cuz should 90-92. AD really doesn't have nearly as much skills as Cuz. I know this is about 2k, but anyone give Live a run yet? I've been playing the game for a while and I actually like it. Pro-am is such a sweet add on. The developer has been pretty tight-lipped about how interactive the high school and college gameplay is. I'm not holding my breath for anything more than a few cutscenes featuring some of the licensed schools, in all honesty. I tried the Live Pro Am, but I wasn't sold on it. It was a big improvement from last year, but the gameplay isn't where it needs to be to take my dollars. I play 2k15, and like to mess with players tendencies and let the computer verse itself. Big Cuz tied for 1st. Hassan at #10. At least they didn't put Gasol above him. Tim Duncan = Cuz ???? And they have 06 Miami Heat Shaq at an 89..? 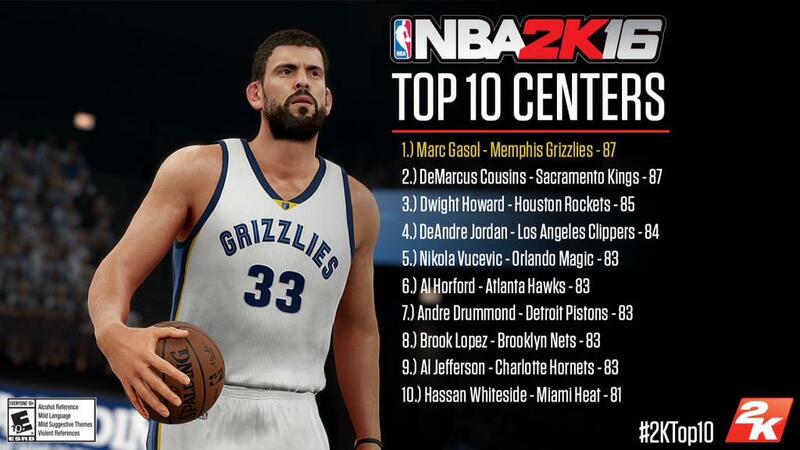 Wow Hassan Whiteside went from like a 57 to 81 and being a Top 10 center in the NBA according to 2k? The way I understand it, the rating system is tied to real, in-game production with some thumbs on scales for name recognition. Whiteside was the second most productive center per 36 in the league last year with 18 points, 15 rebounds, 4 blocks and a steal. That is roughly on par with Marc Gasol with more rebounds and blocks but fewer assists. If Whiteside can continue to be as productive this year, I wouldn't be surprised to see him bump up to an 85 or higher by season's end. Hell yeah! PS4, MyCareer, MyGM and MyTeam. Picked it up and played it a little last night before bed. I am very happy with the improvements to defense. Offensive players really have to work to get good looks. Very rewarding for solid strategic play. Of primary importance, big men play big. Cousins is a dominant force inside this year. I am very happy with that development. He is. At least they gave him a A+ inside rating. About time. I remember when he would consistently get B's. Also Love the new Vertical Defense move for big men. With WCS and Cuz, I've never seen more realistic rim protection in a video game EVER.